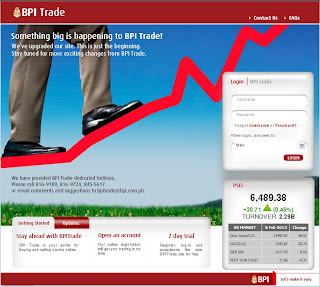 After more than a month of beta test drive, BPI Trade, the online brokerage of BPI Securities now rolls out to all users the new trading platform. The new BPI Trade features a redesigned interface, improved research including technical and fundamental reports, charting capabilities (for technical analysts), ability to see who made bids in a particular stock, portfolio information including profit/loss summary and many more. With this new trading platform, BPI Trade is now at par with other online brokers. The features and capabilities of the new BPI Trade closely resembles that of the First Metro Sec. That is expected though since both are powered by Technistock platform. The Philippine Stock market is on the bull run since last year. PSE Composite Index (PSEi) has breached several major levels in the past year. Last March 2012, it breached the 5000 points. Then comes early this year, on January , it breached the 6000 points level. The PSE Composite Index (PSEi) Year-on-Year return is now at 64%, one of the best performing bourse in the world. With the anticipated investment grade to the country, the stock prices are expected to rally. 1. Choose a broker and open an account. - a broker is like a middleman who will do the actual transaction in the Philippine stock exchange. - stock brokers are either online or not. Some of the famous online brokers are: BPI Trade, Citisec Online, and First Metro Securities. 2. Fund your account. Most brokers (especially online) requires only a minimum of 5000 Pesos.